Two bedroom, two bathroom villa, with air conditioning. Use of lovely community pool. Now with free wifi. 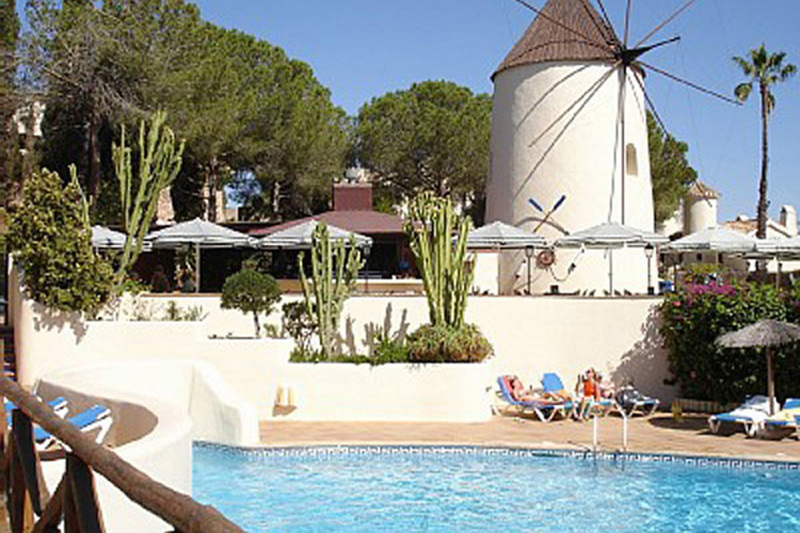 Los Molinos, translated as The Windmills, is a picturesque community in an elevated location of the famous La Manga Club Resort. Its central feature is the stunning swimming pool with waterfall, separate children’s pool and poolside bar and restaurant (seasonal opening). The villas in a traditional Spanish style, feature barbecue terraces with attractive views. This two bedroom, two bathroom, villa has private terraces with barbecue facilities and great views. Free wifi internet access. Enter into living and dining room which has a ceiling fan, satellite TV, CD Player, a telephone for making free calls within the Resort and patio doors lead to a terrace with barbecue and outdoor dining facilities, with views across the community and beyond to the Mar Menor. The kitchen is equipped with a dishwasher, microwave, oven, hob, extractor fan, fridge freezer and coffee machine. Stairs down to the bedrooms. The master bedroom has single beds which can be made into a double bed if preferred, patio doors to the community gardens and has a full en-suite bathroom with twin wash basins. The second bedroom has twin beds, satellite TV and use of the additional shower room which has the washing machine fitted. From the front of the property, stairs lead to the roof terrace with views across the Resort and beyond to the Mar Menor. In a peaceful elevated location of La Manga Club Resort, air conditioning throughout is included in the prices for all seasons. Private terraces and barbecue facilities. Use of large community pool and gardens.